High-quality mountain bikes, sports bicycles or e-bikes can be stored safely in the bike boxes Velosafe, sheltered from weather and vandalism. There is no reservation in advance necessary for the bike lockers, the system can be rented spontaneously. As e-mobility continues to increase, the system also addresses this trend: Velosafe can be used as an e-bike charging station to charge the batteries of e-bikes or electronic devices. The Velosafe housing and the door are made of 1.5 mm thick, powder-coated sheet steel. The user station also consists of 1.5 mm thick sheet steel and is reinforced by two aluminum profiles. Each module of the bicycle garage contains two bicycle boxes, which are arranged one above the other. 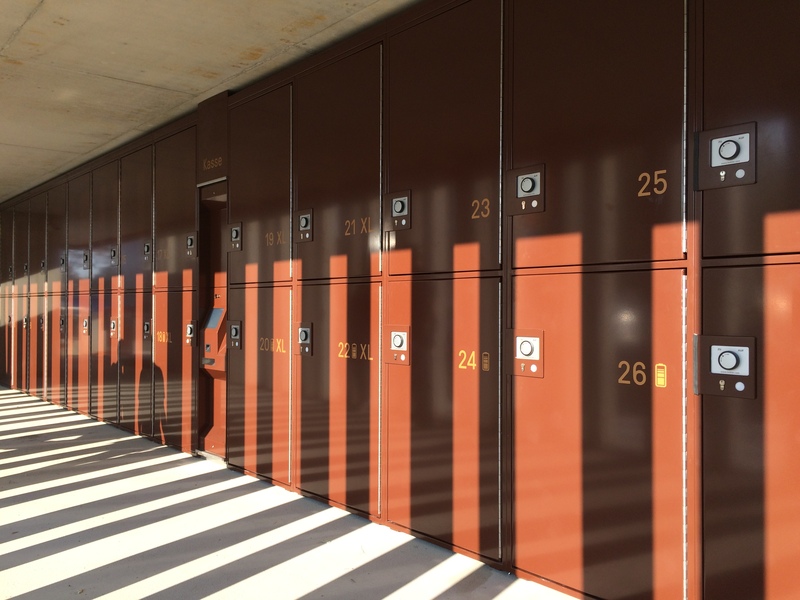 The bicycle lockers are equipped with emergency releases in case of power failure and from the inside of the compartments. A combination with smart lockers for luggage is possible. Velosafe can be installed outdoors as well as indoors. The bicycle locker compartments can be optionally equipped with power connectors (Locktec Power Charger) for charging e-bikes or mobile devices. The bicycle garages are available in different colors - of course also in special colors and your personal CI design. The user station consists of a PC and touch screen with multilingual, intuitive user interface. It is available integrated and separately. The payment of the rent can be made by coins, banknotes or cashless. Increase in rental income through profitable short-term rentals instead of low-paid long-term rentals. 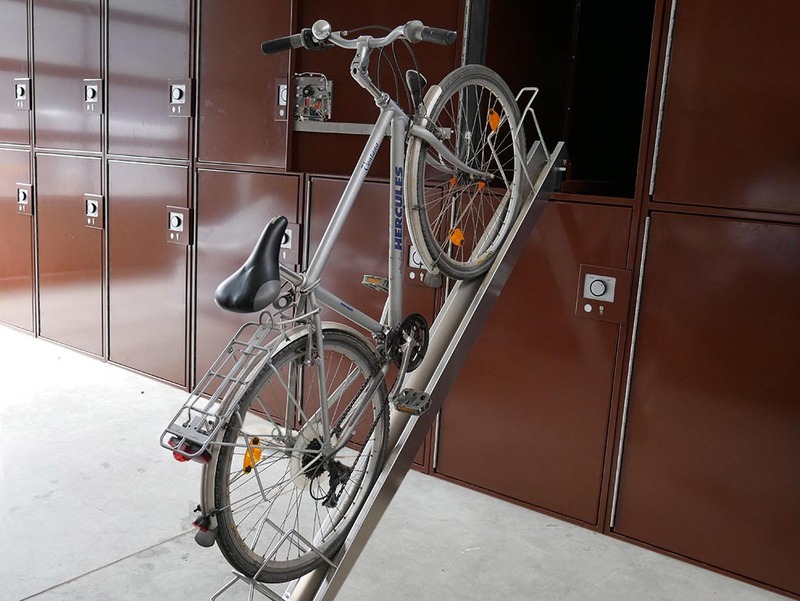 Velosafe bicycle garages can be combined with Locksafe5 luggage lockers and still only one operator station is needed. Additional increase in turnover by equipping the compartments with a charging station for batteries or for mobile devices. Rental and pick-up possible around the clock, without waiting at the counter. Velosafe systems, prices and revenues can be monitored remotely. Rental and pick-up possible around the clock – no waiting at the counter. Rental of the Velosafe garage spontaneously possible – no app or a pre-booking is necessary. In addition to the sheltered storage of the bicycle, batteries or mobile devices can be charged. with e-bike charging option. The bicycles are sheltered from weather and vandalism. There is no reservation in advance necessary, the system can be rented spontaneously. Bicycle garage compartment with guide rail for bicycles guarantees easy use.